Mark is a strategist, author, and entrepreneur. His work combines collective intelligence with networks, complex systems, behavioral science and neuroscience. He is the founder of Orcasci, a consulting firm designing scaling and growth strategies with recent clients including the $1m Global Teacher Prize with the Varkey Foundation. Mark is also the CEO and founder of Vork, a business social networking application. 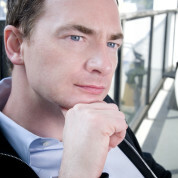 Previously Mark co-founded Imaginatik plc, a pioneer in crowdsourcing and collaborative problem solving for innovation. During his 16 years at Imaginatik, Mark worked with hundreds of companies, including Allianz, Bayer, Cargill, IBM, Merck, Novartis, Pfizer, Whirlpool and Xerox. The World Economic Forum nominated him a Technology Pioneer and a Young Global Leader. Mark is a Professor of Global Strategy at Hult International Business School. "The Global Teacher Prize is an amazing initiative in identifying incredible teachers and giving a platform to celebrate the best in teaching from around the world."